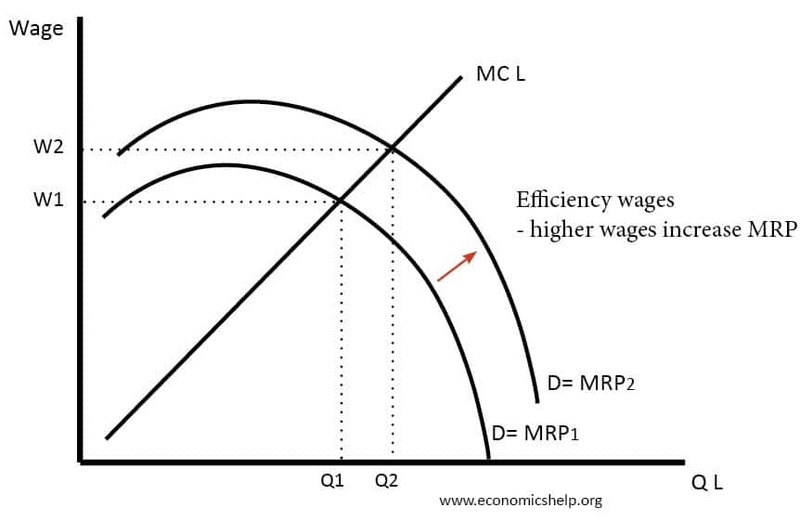 The idea of the efficiency wage theory is that increasing wages can lead to increased labour productivity. Therefore if firms increase wages – some or all of the higher wage costs will be recouped through increased staff retention and higher labour productivity. In theory, higher wages could cause increased labour productivity (MRP). In this case, the wage increases can pay for themselves. Fear of losing jobs “Shirking model”. The argument is that if workers are paid a higher wage, they have more to lose from being made redundant. Therefore, if they have a job with a wage significantly higher than benefits or alternative jobs, they will have greater motivation to impress their boss and keep it. Shapiro and Stiglitz posited that workers with a higher wage will work at an effort level which involves no shirking. This wage is above market clearing levels. Loyalty. Secondly, if workers receive a higher pay, they may just feel more loyalty towards the company and be willing to work harder and with more determination. By contrast, if they feel they are being exploited by a monopsonist employer, then they will do the minimum amount of work to get by, but try to take more breaks and not work as hard. Labour market “Gift Exchange” G. Akerlof (1982) saw the labour market has a ‘gift exchange’ where good labour relations depended on goodwill. FIrms could pay wages above market clearing levels, and in return, workers would take on more responsibility and initiative. Lower costs of supervision. JB Rebitzer (1995). Rebitzer noted that lower wages were associated with higher levels of supervision. WOrkers receiving higher wages were more motivated and therefore needed less managerial supervision. Attract higher quality labour. If a firm pays above the market clearing level, it will attract a better quality worker who will feel they can get the relatively better-paid job. Nutritional theories. In developing economies at very low rates of pay, increasing wages can enable a reduction in absolute poverty – better health, and nutrition lead to better quality labour. 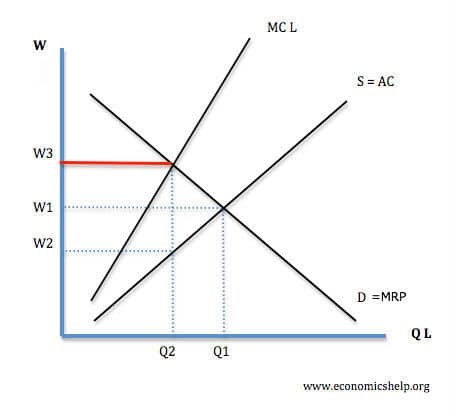 Shirking models of efficiency wage theory, state that employers have an incentive to pay a wage above the market clearing level. If this is the case, and efficiency wage payments are widespread then it can cause involuntary unemployment with wages above the equilibrium and wages. 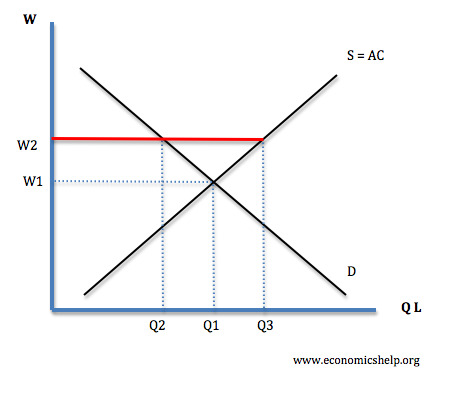 However, in the case of monopsony, higher wages can increases wages without any cost of unemployment. Compensate for Boring work on his efficient assembly lines. Ford increased productivity by revolutionary use of assembly lines, but was worried a low wage, workers would get bored and stop working. Raff and Summers (1986) concluded that Ford’s five dollar day was consistent with what was expected of efficiency wage theories. In practice, many factors determine worker morale and productivity, wages are just one of them. Often other factors are more important such as work conditions, management, e.t.c. If non-wage factors are negative, then higher wages may be insufficient to boost productivity. It depends on the reaction of other firms. If other firms also start paying above market clearing levels, then the gain from attracting best quality workers will be lost. Firms with monopsony power may not need to pay higher wages to create the threat of workers losing their jobs. I have appreciated the answer, thanks alot!